This is the web home of the Greater Midwest Lego Train Club. 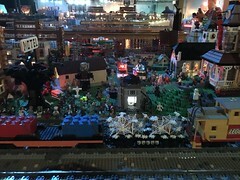 We are a group of adult hobbyists who have teamed up to create an epic scale train layout made complete from LEGO® brand bricks. We have been displaying our layouts at various regional and national events since the early 1980’s. From late 2010 through early 2018, we had the privilege of residing inside Brickmania Toys in Northeast Minneapolis, where we were able to host many public open houses. We appreciate everything they’ve done for us and look forward to future collaborations, but due to rapid growth in the company, we have had to relocate. We have also had a long partnership with the Minnesota Transporation Museum/Jackson Street Roundhouse in Saint Paul, Minnesota. Currently, we do not have an exhibit there because the building is undergoing renovation. As of March 2018, we are pleased to announce that our train layout resides at the Twin Cities Model Railroad Museum in Saint Paul. We look forward to creating new and exciting displays as we develop our collaboration with TCMRM! We also periodically display at model railroad and LEGO fan events across the country and will post dates of our future appearances. Wow…wow….wow… I’m a supervisor at the St. Cloud Public Library in St. Cloud, Mn. 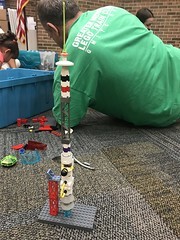 I found your site because I’m looking to bring in a lego club in the fall in correlation with a Lego building contest we’re planning. If there is any way we could have you here to display your amazing things, it would make me a very happy sandy. Please contact if you’re interested. Thanks!! I need to verify. It says you have open houses the 2nd Saturday of the month and that there won’t be any open houses in April and May but are you NOT having your Saturday open house then on the 8th of February? We have a Jr Train club that was planning a field trip for that day but it sounds like we wouldn’t be able to come on a Saturday until June? Brickmania will be open EVERY 2nd Saturday 10am to 4pm as well as the 1st Thursday of the month from 5pm to 9pm. The latest information about Brickmania’s open houses can be found HERE.